Jannicke Wiik-Nielsen, researcher at the Norwegian Veterinary Institute (NVI), is the only Nordic photographer chosen to participate in the renowned international exhibition held by the UK’s Royal Photographic Society. The exhibition will tour the UK and Ireland in 2019. «Love and hate». The photo shows two roundworms, with the female entwined around the male.Photo: Jannicke Wiik-Nielsen, Norwegian Veterinary Institute. 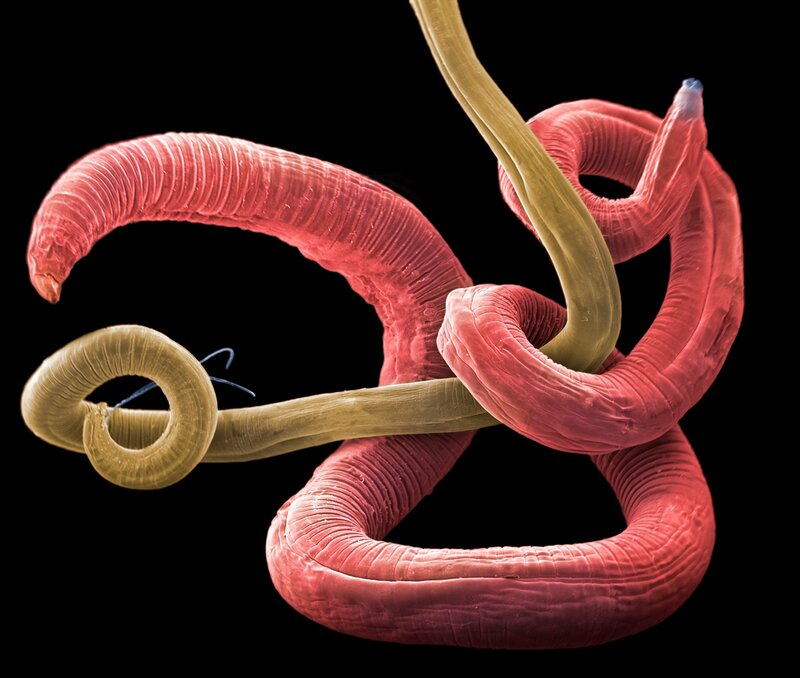 Wiik-Nielsen’s winning photographs - taken through a scanning electron microscope - are ‘Love and hate’, which shows two roundworms, and ‘Dangerously beautiful’, which shows a ringed tubularia (ectopleura larynx). “I take pictures in connection with various research projects at the Veterinary Institute. The scanning electron microscope has many applications in medicine, criminal investigation and material analysis. At the Veterinary Institute we mainly use electron microscopy to study bacteria, fungi and parasites that can cause disease in animals and, in some cases, in humans,” says Wiik-Nielsen. Eventually, the work awakened a fascination with an incredibly detailed and fascinating world that she felt existed on the border between art and science. “The Veterinary Institute encouraged me to submit 'The hidden world' photo series to the Royal Photographic Society's competition, The International Photography Exhibition,” she says. The International Photography Exhibition has been running almost annually since 1854 and now, with its 161st exhibition, is the longest-running exhibition of its kind in the world. The two photographs by Wiik-Nielsen included in the final 100 images that make up the exhibition were chosen from 7300 images submitted by 54 photographers from around the world. The exhibition covers many different categories of photography. The exhibition will be displayed in the new headquarters of the Royal Photographic Society in Bristol followed by visits to the Royal Albert Hall in London, the Midlands Art Center in Birmingham, the Municipal Gallery in Dublin and the HIP Festival in Hull. During electron microscopy the preparation is bombarded with electrons on a surface covered with metal. Depending on the purpose of the research, Wiik-Nielsen enlarges some of the subjects up to 60,000 times. Since the electron microscope can only produce pictures in monochrome, Wiik-Nielsen colorizes the images to make it easier to see structures and contrasts. One image chosen for the exhibition is entitled "Love and hate" and shows two roundworms, with the female entwined around the male. "I like this picture a lot, but many will probably think it's a little repulsive. It is therefore extra fun that this picture won over the jury," says Wiik-Nielsen. Roundworms are small worms that live everywhere on earth. There are over 15,000 different species. Giant roundworms, tapeworms and pinworms are three common types in Norway. The roundworms in the picture were found in the intestine of a cormorant found dead by a hiker and examined at the NVI during avian flu investigations. These roundworms are related to another type that can cause the disease anisakiasis in humans when consumed in infected fish. The roundworms lay eggs in the intestine of the cormorant and the eggs are excreted out. They hatch, and small crustaceans are infected by eating the newly emerged worm larvae. Fish then eat the infected crustaceans and the cycle is completed by the cormorant eating infected fish. «Beautifully dangerous». The tiny animal is a hydroid that grows on ropes and underwater surfaces and has the ability to shoot small "poison arrows" in the same way as stinging jellyfish or nettles. Photo: Jannicke Wiik-Nielsen, Norwegian Veterinary Institute (NVI). 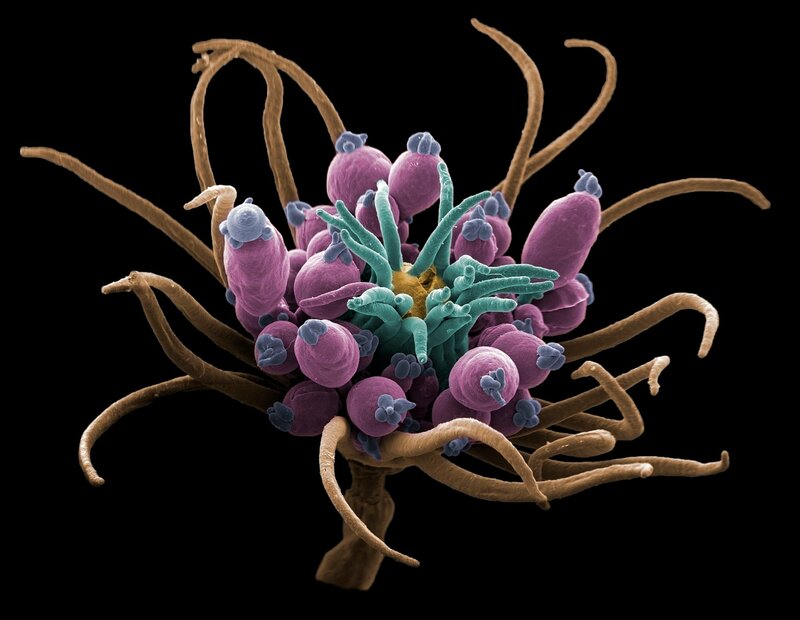 The second picture chosen to embellish walls at various venues in England and Ireland next year shows a small cnidaria, Ectopleura larynx, that looks like a beautiful flower. The tiny animal is a hydroid that grows on ropes and underwater surfaces and has the ability to shoot small "poison arrows" in the same way as stinging jellyfish or nettles. The image has previously won the competition 'Art in Science' at the University of Copenhagen. The image of Ectopleura larynx was taken in connection with a research project investigating whether farmed fish are harmed by exposure to its “poison arrows”. The hydroid is one of Norway’s most dominant organisms and, together with algae and shells, attaches itself to the structures and moorings of fish farms. This is a major challenge for the aquaculture industry because the cages become heavy, water flow is reduced and oxygen deficiency occurs. The cages are cleaned regularly, meaning the hydroids are dislodged and often come in contact with the fish’s gills. "The research project's goal was to investigate whether the "poison arrows" damaged the gills, thus making the fish more susceptible to gill diseases. We conducted an infection trial against amoebic gill disease (AGD) which is a major problem for the aquaculture industry. The trial showed that the gills were damaged by the hydroid’s stings, but repaired themselves so quickly that the fish did not develop AGD to a greater extent than fish that were not exposed to the stings," says Wiik-Nielsen. 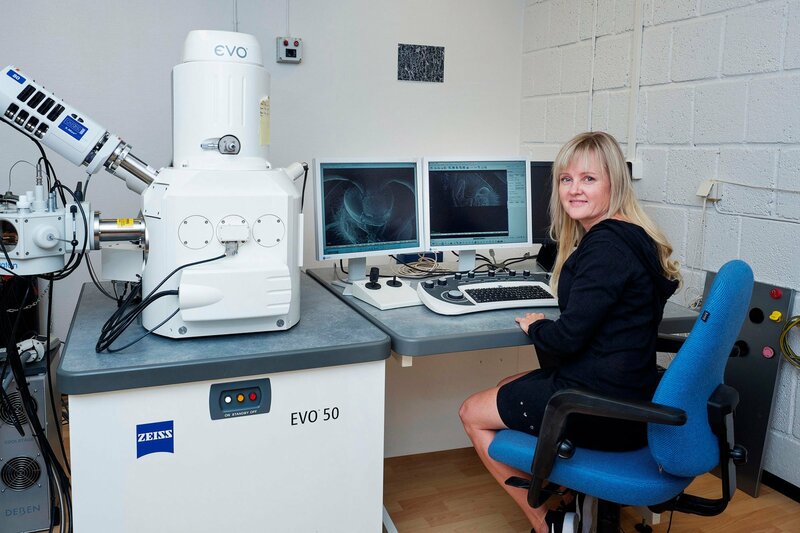 Researcher Jannicke Wiik-Nielsen and the scanning electron microscope at the Imaging Centre, NMBU. Photo: Jo Straube. “That two pictures were selected for the exhibition motivates me to continue dissemination of research through images. I also provide pictures to the reputable image database Science Photo Library and I am proud that the Veterinary Institute chooses to focus on such alternative methods of dissemination. Among other things, we aim to complete an exhibition that will tour Norway in the years to come. I hope that the photos can help raise the curiosity and fascination of children and adults in the tiny little hidden world we have around us every day," says Wiik-Nielsen. Read more about the exhibition on the Royal Photographic Society's website.